Thomas Moore with his huge carp. The Easter holiday period saw many of our local waters spring to life and with the weather a little better we all enjoyed some much improved sport. I was pleased to see quite a few youngsters trying their hand at fishing, some for the very first time. Down at Float Fish Farm Fishery they have the ideal lake to get bites. It’s full of small fish eager to feed on maggot so there’s no need for any fancy baits. 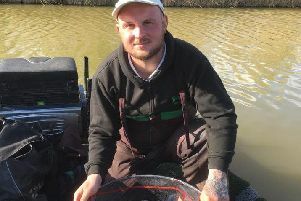 Kingsland Fishery out at Coates has been in fine form and it was there that young Thomas Moore from Yaxley netted his best fish to date last week, a cracking 17lb Ghost Carp . You might also like to try one of the smaller waters in the area. Weston Lake at Peakirk is full of fish and you’d be unlucky not to put a decent weight together there. There is also Haddon Lodge to the west of Peterborough, just off the A1. Here you can try your hand on pole feeder or waggler fishing or perhaps like me you enjoy fishing off the top. Lucio Melillo had several good fish to double figures last week and as the weather looks like warming up it’s an ideal time to give this method a try.